Samsung has been playing with the idea of foldable smartphones for nearly a decade. It was eight years ago when they first showcased a flexible display, but it is now finally ready to turn concept into reality. The latest leaks tease us with some exciting news...the release date of the flexible wonder. What will smartphones look like in 2050? It's not the first rumor about the possible release date of Samsung Galaxy X, the incoming Korean folding smartphone. This time it is the Chinese leaker IceUniverse on Weibo that indicates a possible time window for the arrival of the Galaxy X. According to the source, we should be able to admire the device during CES 2019 in Las Vegas, then again in January of next year, while the MWC in Barcelona (or a simultaneous dedicated Unpacked event) will be reserved for the mainstream Galaxy S10. These statements would confirm, if verified, all the rumors that have spread recently. Are you looking forward to the Galaxy X? What do you expect from it? Let us know in the comments! When will the Samsung Galaxy X be released? How will the foldable display work? What will the device look like? What other special features could it have? When will we see the Samsung Galaxy X? There have been rumors about this device recently, some saying we would see a prototype soon, but our hopes have just been dashed. According to Korea Herald, the Principal Engineer of Samsung Display, Kim Tae-woong said that the bezel-less display is a success right now and there is no need to rush a technology that won't be ready for commercial launch until 2019. DJ Koh, chairman of the brand's mobile division, appeared to confirm this at the Las Vegas CES 2018 by stating that the company plans to launch the foldable phone next year. The production of this mystery flexible phone production should start by the end of 2018, unless there are complications with the development of the UX. Samsung's official Korean language website was recently updated with a support page for device SM-G888N0, which happens to be the model number for the Samsung Galaxy X (N0 is for the Korean market). Initially brought to light by Mobiel Kopen, this support page doesn't give much in the way of details regarding the specifications of the foldable phone, but it is an indication that Samsung is preparing for an official announcement very soon. The presence of the support page suggests that Samsung could be ahead of schedule in its ambition to unveil its first foldable smartphone. Could we be looking at an end of 2018 release after all? Everyone wants a big screen, no one wants to carry it around. It's the paradox of the smartphone world that drives us crazy almost as much as battery life vs. battery size. Foldable screens are here to save the day. First things first, the Galaxy X will be foldable, but we don't mean "foldable" like your old flip phone. There has been separate rumor that Samsung has been working on a different foldable device (without a foldable screen) that would have a hinge like a laptop, allowing two AMOLED screens to rest on top of each other. To illustrate, check out the patent below. Below, you'll see the patent for a true foldable screen. 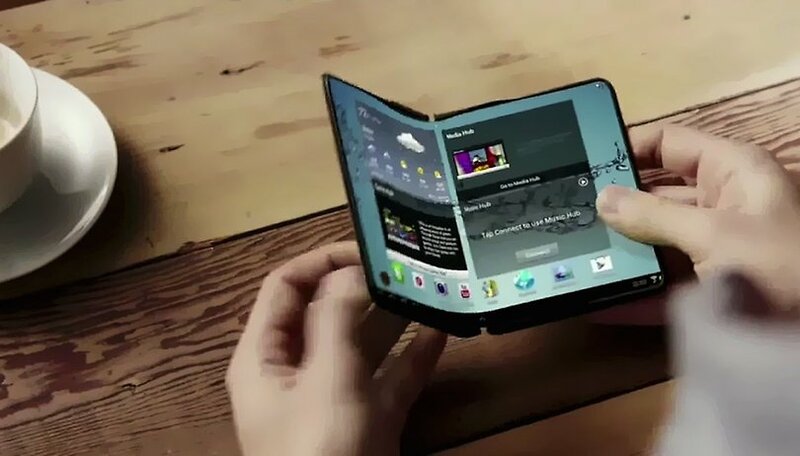 This is what we mean when we say the Galaxy X will be foldable. You'll actually be able to bend the screen without snapping it in half and rendering it useless. How well this will hold up over time could be an issue. Constant bending and pressure could cause screen damage, especially if you sit down with your phone in your back pocket. Hopefully Samsung will be able to design around a normal user's behavior patterns, which tend to include throwing your cell phone into bag full of stuff, dropping it, sitting on it and, even worse, letting your child play with it. Samsung and foldable screens: success story or epic fail? Below you can see an old example of Samsung's attempts at making a curved screen, which show a somewhat thick and bulky design concept. Could the Galaxy X also be this bulky, or will it be thin and elegant? The success of the idea depends on the execution and Samsung's ability to design with the user in mind. The Galaxy X will have 4K resolution according to SamMobile, but not much else is known about the display's specs yet. It is rumored that the touch area will extend beyond the front of the device to its edges, and work like a Galaxy S7 Edge in that respect. What will the Samsung Galaxy X look like? The overall design of the Galaxy X could feature the same Galaxy DNA we're all used to, but there's no telling what could change due to the foldable screen. Camera, button, and fingerprint sensor placement could really affect the look of the device. The overall shape will obviously change, and rounded edges could make the device more ergonomic, both when folded and when open. The Galaxy X is likely to take advantage of biometric technologies for security, including the usual fingerprint scanner plus facial and eye recognition, and palm scanning. According to a new report from ithome, Samsung's battery division SDI has completed foldable battery designs with capacities ranging from 3,000 mAh and 6,000 mAh. Battery life is one of the main modern gripes about smartphones so a 6,000 mAh battery (double that of the Galaxy S9!) would certainly be more than welcome, especially given that the Galaxy X is expected to have a large power-hungry screen. For a rumored price of around $1800, I expect to see the Galaxy X packing nothing but the best Samsung has to offer on the inside. What do you think are the advantages and disadvantages of foldable screen technology? Are you interested in trying the Galaxy X, or do you prefer to stick with the current style of phones until they've worked out all the kinks? Let us know in the comments. Gen 1 or 2 folding phones? Probably not. Will be too many headaches trying to protect the display, which is FRAGILE. Considering how many dropped, broken glass screens you see today, and, given how people treat these overpriced phones, the flex-display will have to be made of carbon fiber, to withstand the forces of humans LOL. Thanks a lot . big relief! No not Vibranium, it must be made from Unobtanium. At least it should be for what they will charge for these phones. Didn't the big bendy battery cause the 7's to blow up? Stuffing too large of a battery into a tiny slim phone? LOL. Yeah, I'm sure this is different, but LiOn really doesn't like to be moved around. The cathode plate insulators are tiny. Any weakness allowing the anode and cathode to meet, and BOOM! Well, the latest Oppo find X is quite the newest technology. A jack in the box pop-up camera. But it is a moving part not solid state. The question I have how durable will it be in the long haul? But I do think it's a cool feature! Foldable would be nice, but no one works on truly unbreakable screens, or battery technology. Motorola’s attempt, from what I heard has some qwerks with their unbreakable screens, but they are trying. Increasing battery capacity for extended use, is fine, but compromises are made to accommodate them. “Real world” , useful tech, instead of “entertainment” tech is needed. If any OEM is gonna perfect a foldable phone it would be Samsung. I think durability would be a major concern. I'm not sure if I would like the idea or not?? I prefer to stick with the current 'non-foldable' devices until Samsung has worked out all the rough edges. Let's see what the deal with foldable screens is. This tech will decrease the size of our devices. Why would we want that? I feel the basic issue is not that we find bigger screens difficult to put into our pockets. It's that we find bigger screens great when we're reading, watching videos or pictures. But while calling, texting, and numerous other activities like setting alarms and reminders, taking quick notes, we find a smaller screen operable with one hand more convenient. This problem doesn't get solved with a foldable screen. Nor does it get solved by the currently available technique of reducing the working area of the screen, since the effect is esthetically very unpleasant. lol you just made the case for a foldable screen. when someone wants a small screen for mundane tasks and a large screen for reading or videos, two screens or a foldable screen makes perfect sense. i don't see how in any way you've made a case against. the problem definitely gets solved with a fold. Great point about jeans. Perhaps the fact whether you are wearing jeans or baggy trousers does make a difference in the type and size of mobile phone you choose to buy :-). I personally have no interest in a foldable screen. I think that they will be easily damaged because of the soft flexible marital they have to be made of. It will also make the phone very thick, which I would not like in my pocket. They will not flip open like the old flip phone you have to use both hands to open them. Just a gimmick as far as I am concerned. Been watching and waiting to see the actual thing instead of strategicly released spins. Nothing that I need right now but I can see the advantage of a phone that will fold out to double as a tablet. Right now I'm content with my phone in one pocket and a tablet that for all intents and purposes they replace about 90% of my laptop use and are alot easier to keep with me. I kind of think for this to take off at some point the productivity side of things is going to have to catch up with the entertainment side. At some point you have to ask yourself how much you are willing to spend on a device that makes calls and sends text that I can play games and watch videos on. As it sits right now we already have that in a non foldable version with provider released tablets that can sync to your existing cell so you can make and receive calls and text from the tablet without the phone present all linked to the same cell number. A foldable screen is definitely an interesting idea, but the first foldable device mentioned (two screens overlapping) seems more durable, hence practical. Like most people here, I await an actual device, along with specs and pricing. Will it still be premium without glass on the back?